If you were having a sky-diving on planet Mars since the past months, or if you were too enthusiastic in getting lost within The Hobbit’s World – wake up Sid! There’s news concerning PHP Land! On “its” 10th birthday, last December 2012, your “PHP Magazine for PHP Professionals” (The one & only PHP|Architect) announced on its portal that it’s brand, owned by BlueParabola, is being ‘safely & soundly‘ handed over to The PHP Musketeers aka Musketeers.me for a smooth and more dynamic life. Why you say!? Well, the ex-founders/leaders of the successful 10yrs of PHP|Architect (namely Marco Tabini & The BlueParabola Members) thought End Of World was really scheduled at 21/12/2012. So, you get the picture? >> What motivated the Musketeers.me Team to acquire PHParch.com? Was it a group idea or someone brought this idea forward inside the team? We just happened to be in the right place, at the right time. The Musketeers.me team has been building a consulting portfolio, but our dream has been to work on a company of our own. In fact, we had already been discussing running some of our own conferences. We realized, however, that having enough steady consulting work to allow us to focus on our own products on the side was going to take a long time. We attempted a Kickstarter campaign to jumpstart this, which was a great learning experience, but ultimately did not raise the capital we were hoping for. We then heard through the grapevine that php|architect was looking for a new home, and we knew it was the perfect match for us. Our entire team is already deeply involved in the community (including 3 different PHP user groups), and we are excited to be working with a company that exemplifies our excitement for the PHP community. >> The positive things of PHParch.com down the recent years would be..? Honestly, we feel pretty much everything has been positive (or else we wouldn’t have acquired the brand). php|architect is a strong brand with multiple product lines (magazine, books, training, conferences), and we are excited to be working with every aspect. >> Things that PHParch.com lacked down the recent years would be..? We don’t feel that there is much that was lacking; but if you were to put us on the spot, we’d suggest perhaps just “fresh blood“. The previous team has done a great job of championing the brand of PHP over the years, and we are extremely excited about taking over the reins and making plans to keep things moving forward. >> What are the future plans for PHParch.com (with the Musketeers.me leadership)? We really don’t plan on (immediately) changing anything. We want people to know that their books will still be available, the magazine will continue to be delivered monthly, and the conference line will continue. At the moment, we have a million ideas and dreams, but we also know that we have a lot of work ahead of us before we fully understand the business as a whole, which is key to the success of any new idea. Our first goal will be to make the existing processes more efficient, and then we will begin to implement our new ideas. >> In the inside, how is the team going to be structured – will there be a merging of the existing staffs or how is it gonna be? To be clear, only the brand of php|architect, and all of its related sub-brands, have been acquired by Musketeers.me from Blue Parabola. Blue Parabola, the company, still exists, and you’ll have to talk to them about what future plans they have. However, we are happy to announce that we have hired [Beth Tucker Long @e3BethT] to join us at Musketeers.me, continuing as the Editor-in-chief of the magazine and book lines, as well as helping out with everything else that we do. As far as the Musketeers.me team goes, we are continuing to work on our consulting projects (we do have an acquisition to pay for after all), but the whole team is also focusing on [php|architect @phparch] as needed. For now, [Eli White @eliw] has taken the lead role in heading up the php|architect stewardship, and [Kevin Bruce @kevinbruce] will be heading up the design aspects of everything (web, magazine, books, etc.). >> Concerning the famous phparch magazine, events..etc – Will they still be same or is there any changes being planned? our own mark on the company! >> Any message YOU want to broadcast to The PHP Community with respect to the acquisition of PHPArch.com? We are excited to be working with php|architect, and we look forward to continuing its community involvement and educational outreach. We look forward to the coming years and see great things not just for the brand, but for PHP in general! >> For those that have a vague idea, what is (or what will be?) the aim and objectives of PHPArch.com? The goal is (and was), simply to be a venue through which education and awareness of PHP can be expanded. We also are here to help enable the PHP Community to continue to grow through our events, magazines, and other product lines. >> What are the challenges that YOU will be facing? The biggest challenge right now is just understanding and streamlining ten years worth of business knowledge and software. Luckily, we feel fairly confident that this transition will go smoothly since our staff has a wealth of knowledge to bring to the table, including past magazine and conference experience. >> Final words – If YOU want to add anything? We’ve announced the dates for tek13, and both the Call for Papers and Blind Bird pricing are available until January 15th, so we’d encourage everyone to check it out and plan on seeing people in May in Chicago! Also for anyone who isn’t subscribed to the magazine at the moment, we’d encourage you to sign up and be ready to see all the future enhancements we are working on! Closing Out – Thanks + Happy New Year ALL! 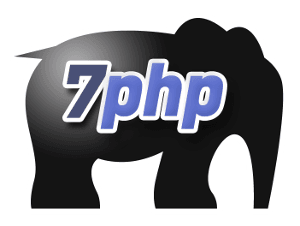 I also take this opportunity to thank all the readers and followers of 7PHP for their loyalty and support during the last 2012 which really saw the birth of 7PHP Interviews. Looking forward to meet your expectations and going beyond with 2013, of course with your ever-needed support!